PASADENA, CA; January 16, 2017 – PBS announced today at the Television Critics Association Winter Press Tour that THE GREAT BRITISH BAKING SHOW will return for a fourth season on June 16, 2017, airing Friday nights at 9:00 p.m. ET (check local listings). This upcoming season is the BBC’s most recent season, which received the highest-ever viewership for the series. PBS also announced it has committed to a fifth season of the series that has previously aired on the BBC. THE GREAT BRITISH BAKING SHOW follows amateur bakers from diverse backgrounds who tackle culinary trials that increase in difficulty as the competition unfolds. In each episode, challenges come in three categories: a Signature Bake, to test the contestants’ creative flair and baking ability; a Technical Bake, in which challengers receive basic recipes with ingredient lists and minimal instruction; and the Showstopper Bake, designed to display depth of skill and talent. As in past seasons, bakers will be judged by Mary Berry and Paul Hollywood, two icons of British baking. With nearly 60 years of cooking experience, Berry established herself as a leading food writer and broadcaster. Over her career, she has published 70 cookbooks that have sold millions of copies around the world. She was also appointed Commander of the Order of the British Empire (CBE) during the Queen’s 2012 Birthday Honors. The son of a baker, Paul Hollywood is one of the U.K.’s leading artisan bread makers. Though trained as a sculptor, he was persuaded by his father to join the family business and to combine both his artistic and culinary talents. Hollywood has worked in some of the world’s most exclusive hotels, including London’s Dorchester. He published the best-selling 100 Great Breads, which to date has been translated into seven languages. Comedy duo Sue Perkins and Mel Giedroyc are also back as the series hosts who keep the contestants and judges grounded, providing the right balance of humor, support and naughtiness. Each new episode of THE GREAT BRITISH BAKING SHOW will be available to stream the morning after broadcast on pbs.org. It will also be available on PBS station-branded digital platforms such as ROKU, Apple TV and Google Chromecast, as well as on PBS iPad and iPhone apps. All three previous seasons of THEGREAT BRITISH BAKING SHOW are available via Passport, a benefit for local PBS station donors, offering extended access to a rich library of public television programming (contact your local PBS station for details). Throughout the season, fans can visit PBS Food to learn more about the contestants and get exclusive recipes, photos and video clips from the program. Known as “The Great British Bake-Off” in the U.K., the show is produced by the award-winning Love Productions and was created by Anna Beattie and Richard McKerrow. Executive producer is Anna Beattie, the director is Andy Devonshire and the series producer is Paolo Proto. For more information, screeners and images, visit the series’ PBS Pressroom page. THE GREAT BRITISH BAKING SHOW has won three BAFTA Awards in the six seasons that have transmitted in the U.K. In 2014, the show moved from BBC Two to BBC One. The ratings have grown over the six seasons to date. With an audience of more than 15 million and an audience share of 55 percent, last season’s finale was the highest-rated show in the UK in 2015 and the BBC’s highest-rated show since 2010. “The Great British Bake-Off” has spawned several spin-offs: The Masterclasses, Celebrity Bake Off, Junior Bake Off, which just secured a BAFTA Award for children’s entertainment, and most recently Bake Off: Crème de la Crème. The family of programs also includes The Great British Sewing Bee and The Great Pottery Throw Down. 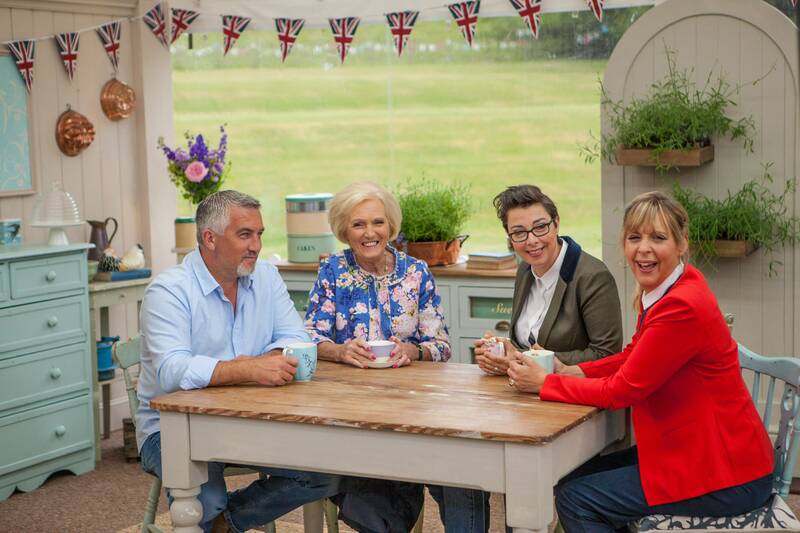 The “Bake Off” format has sold in 23 territories worldwide and is one of the most successful returning series in Holland, France, Italy, Germany and throughout Scandinavia. Love Productions is an award-winning production company based in London, Bristol, New York and Los Angeles. It has produced Baby Borrowers for the BBC in the U.K. and for NBC in the U.S., and the award-winning series Famous Rich and Homeless and Make Bradford British. Recently, Love produced the highest-rated Channel 4 series, Benefits Street, and sold a 70 percent stake in its business to BSkyB. PBS is the original home of cooking and still offers the very best in food and cooking. From A Chef’s Life to The Mind of a Chef to BBQ with Franklin, PBS programs and chefs have received more Peabody Awards, Daytime Emmy® Awards and James Beard Foundation Awards than any other network. Viewers can explore more deeply on the award-winning PBS Food site (pbs.org/food), which brings together the best food and cooking content from across public television with award-winning digital videos, recipes, articles and more. PBS, with nearly 350 member stations, offers all Americans the opportunity to explore new ideas and new worlds through television and online content. Each month, PBS reaches nearly 100 million people through television and nearly 33 million people online, inviting them to experience science, history, nature and public affairs; to hear diverse viewpoints; and to take front row seats to world-class drama and performances. PBS’ broad array of programs has been honored consistently by the industry’s most coveted award competitions. Teachers from pre-K through 12th grade turn to PBS for digital content and services that help bring classroom lessons to life. PBS’ premier children’s TV programming, and its website pbskids.org, are parents’ and teachers’ most-trusted partners in inspiring and nurturing curiosity and the love of learning in children. More information about PBS is available at PBS.org — one of the leading dot-org websites on the Internet — or by following PBS on Twitter, Facebook or through apps for mobile devices. Specific program information and updates for press are available at pbs.org/pressroom or by following PBS Pressroom on Twitter.